Following the capture of Fort Beauséjour and Fort Gaspereau in mid-June 1755, the large number of New England troops now in Nova Scotia were ordered to seize arms and ammunitions from the Acadians. Later all Acadians in Nova Scotia were ordered to surrender their firearms or be considered as rebels. Delegates from various Acadian settlements were sent to Halifax to request the return of their firearms. When they arrived, these delegates were informed that they must sign an unconditional oath of allegiance— in other words, an oath without any conditions whatsoever pertaining to bearing arms against French of the Micmac. When they refused to sign, the delegates were imprisoned on George’s Island in Halifax harbour. In July 1755, Governor Charles Lawrence ordered the Acadians to send another group of delegates to appear before the Council on Halifax in order to settle the question of the unconditional oath of fidelity to the British Monarch. Despite the fact that Fort Beauséjour had been captured in June, that 2,000 New England soldiers were now stationed in Nova Scotia, and that Admiral Boscawen’s fleet was present in the port of Halifax, the Acadians did not change their position. Like other representatives before them, they refused to sign an oath that would automatically mean that the Acadian population could not remain neutral. This second group of delegates was also detained on George’s Island. On July 28, 1755, when Lieutenant-Governor Lawrence assembled his council, which included for this meeting Admiral Boscawen and Chief Justice Belcher, the decision was made to proceed with the removal of the “French inhabitants” from the colony of Nova Scotia. Instructions for Major Handfield, Commanding his Majesty’s garrison of Annapolis Royale in relation to the transportation of the Inhabitants of the District of Annapolis River and other French Inhabitants out of the Province of Nova Scotia. Having in my Letter of the 31st of July last made you acquainted with the reasons which Induced His Majesty’s Council to come to the Resolution of sending away the French Inhabitants and clearing the whole Country of such bad subjects, it only remains for me to give you the necessary orders for the putting in practice what has been so solemnly determined. That the Inhabitants may not have it in their power to return to this Province nor to join in strengthening the French of Canada in Louisbourg; it is resolved that they shall be dispersed among his Majesty’s Colonies upon the Continent of America. For this purpose Transports are ordered to be sent from Boston to Annapolis to ship on board one thousand persons reckoning two persons to a ton, and for Chignecto, transports have been taken up here to carry off the Inhabitants of that place; and for those of the District around Mines Bason Transports are in from Boston. As Annapolis is the place where the last of the transports will depart from, any of the vessels that may not receive their full compliment up the Bay will be ordered there, and Colonel Winslow with his detachment will follow by land and bring up what stragglers he may meet with to ship on board at your place. Upon the arrival of the vessels from Boston in the Bason of Annapolis as many of the Inhabitants of Annapolis District as can be collected by any means, particularly the heads of families and young men, are to be shipped on board of them at the above rate of two persons to a ton, or as near it as possible. The tonnage of the vessels to be ascertained by the charter partys, which the masters will furnish you with an amount of. And to give you all the ease possible respecting the victualling of these transports, I have appointed Mr. George Sauls to act as agent Victualler upon this occasion and have given him particular instructions for that purpose with a copy of which he will furnish you upon his arrival at Annapolis Royale from Chignecto with the provisions for victualling the whole transports; but in case you should have shipped any of the Inhabitants before his arrival you will order five pounds of flour and one pound of pork to be delivered to each person so shipped to last for seven days and so until Mr. Saul’s arrival, and it will be replaced by him into the stores from what he has on board the provision vessel for that purpose. •To be sent to Philadelphia such a number of vessels as will transport three hundred persons. •To be sent to New York such a number of vessels as will transport two hundred persons. •To be sent to Connecticut such a number of vessels / whereof the Sloop Dove, Samuel Forbes, Master to be one / as will transport three hundred persons. And To be sent to Boston such a number of vessels as will transport two hundred persons, or rather more in proportion to the province of Connecticut, should the number to be shipped off exceed one thousand persons. When the people are embarked you will please to give the master of each vessel one of the letters of which you will receive a number signed by me of which you will address to the Governor of the Province or the Commander in Chief for the time being where they are to be put on shore and enclose therein the printed form of the Certificate to be granted to the Masters of the vessels to entitle them to their hire as agreed upon by Charter party; and with these you will give each of the Masters their sailing orders in writing to proceed according to the above destination, and upon their arrival immediately to wait upon the Governors or Commanders in Chief of the Provinces for which they are bound with the said Letters and to make all possible dispatch in debarking their passengers and obtain certificates thereof agreeable to the form aforesaid. And you will in these orders make it a particular injunction to the said Masters to be as careful and watchful as possible during the whole course of the passage to prevent the passengers making any attempt to seize upon the vessel by allowing only a small number to be upon the decks at a time and using all other necessary precautions to prevent the bad consequence of such attempts; and that they be particularly careful that the Inhabitants carry no arms nor other offensive weapons on board with them at their embarkation. As also that they see the provisions regularly issued to the people agreeable to the allowance proportioned in Mr. George Saul’s instructions. You will use all the means proper and necessary for collecting the people together so as to get them on board. If you find that fair means will not do with them, you must proceed by the most vigorous measures possible, not only in compelling them to embark, but in depriving those who shall escape of all means of shelter or support by burning their houses and destroying everything that may afford them the means of subsistence in the country, and if you have not force sufficient to perform this service, Colonel Winslow at Mines or the Commanding Officer there will upon your application send you a proper reinforcement. You will see by the Charter partys of the vessels taken up at Boston that they are hired by the month; therefore I am to desire that you will use all possible dispatch to save expense to the public. As soon as the people are shipped and the transports are ready you will acquaint the Commander of His Majesty’s Ship therewith that he may take them under his convoy and put to sea without loss of time. Although Grand Pré has become the symbol of the expulsion of the Acadians, the deportation actually began on August 11, 1755, at Fort Beauséjour (renamed Fort Cumberland). The inhabitants in the area were rounded up and imprisoned in the fort prior to being shipped to the British Colonies along the eastern seaboard. 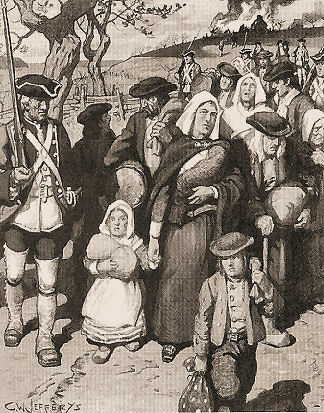 One month later the deportation of the Acadians began at Grand Pré, the most populated of all Acadian settlements. The male inhabitants were ordered by Colonel John Winslow, commander of the New England regiment stationed in the area, to assemble in the church Saint Charles des Mines on September 5, 1755 at three o’clock in the afternoon. The men of Pisiquid were ordered by Captain Alexander Murray to present themselves at Fort Edward. In both places, the assembled Acadians were informed that their lands, their houses, and their livestock would be confiscated and that they and their families would be transported out of the province. The first recorded attempt at ethic cleansing in North America, the Acadian deportation and expulsion, La Grand Derangement. British Governor Charles Lawrence and the Nova Scotia Council decided on July 28, to deport the Acadians. Although Grand Pré to this day is the most well known symbol of the expulsion, it actually began at Fort Beauséjour on August 11. I have received from his Excellency Governor Lawrence, the King’s Commission which I have in my hand and by whose orders you are convened together to Manifest to you his Majesty’s final resolution to the French inhabitants of this his Province of Nova Scotia who for almost half a century have had more indulgence granted them, than any of his subjects in any part of his Dominions. What use you have made of them you yourself best know. The part of duty I am now upon is what though necessary is very disagreeable to my nature. make and temper, as I know it must be grevious to you who are of the same specie. But it is not my business to annimedvert, but to obey such orders as I receive and therefore without hesitation shall deliver you his Majesty’s orders and instructions viz. That your lands and tenements, cattle of all kinds and livestock of all sorts are forfitted to the Crown with all other your effects saving your money and household goods and you yourselves to be removed from this his province. Thus it is peremptorily his Majesty’s orders that the whole French inhabitants of these districts, be removed, and I am through his Majesty’s goodness, directed to allow you liberty to carry of your money and household goods as many as you can without discommoding the vessels you go in. I shall do everything in my power that all those goods be secured to you and that you are not molested in carrying them and also that whole families shall go in the same vessel [this promise was NOT honored in all respect] and make this remove which I am sensible must give you a great deal of trouble as easy as his Majesty’s service will admit and hope that in what every part of the world you may fall, you may be faithful subjects, a peaceable and happy people. I must also inform you that it is his Majesty’s pleasure that you remain in security under the inspection and Direction of the troops that I have the Honour to command. Excerpts from “The Acadians of Nova Scotia; Past and Present” written by Sally Ross and Alphonse Deveau, published in 1992. Saturday – September 6, 1755 The LEOPARD – Captain Thomas Church arrives at Minas Basin. Friday – September 19, 1755 – 230 prisoners had embarked and 300 or more returned from Halifax and were placed aboard ships. The whole population of Minas, about 2,000 (excluding Cobequit and Piziquid) was under armed force of 363 men. The wives and mothers of the captives were allowed to go aboard the ships to bring food. Saturday – October 11, 1755 – The transports were made ready and during the months of October and November, in the midst of mass hysteria and Francophobia that followed the defeat of Braddock and the prejudicial reporting of the Maryland Gazette, and when the excitement was on the increase and the minds of the peolple of Maryland were occupied with these real or imaginary dangers, that were supposed to be so near at hand, the sailing of the ships of the expulsion began the operation of expelling some 913 Acadians to Maryland. Monday – October 13, 1755 – The sailing orders for the Leopold were givin to Captain Thomas Church by John Winslow. The same orders were given to Captain Milbury of the Elizabeth. Thursday – October 16, 1755 – Captain Murray further states: “Two days later, on October 16, 1755, the other transport “Ranger” arrived (in Pisiquid). Note: The above dates will have to be verified. Earlier reports have the ships being loaded on October 27, 1755 and embarking on October 28, 1755. Monday – October 27, 1755 – 493 Acadians from the parishes of St. Famille and L’Assomption in Pisiguit – and 420 Acadians from the parishes of St. Charles in Grand Pre and Riviere-Aux-Canards and St. Joseph in Grand Pre (for a total of 913 Acadians) boarded six ships, with orders that two persons per ton burden were to be placed on the transports, and sailed for Maryland. Among them were the Ranger, (90 tons burden, Francis Peirey, master) with about 323 (or 263), 83 over her compliment aboard, and the Dolphin (87 tons burden, Zebad Farman, master) with 227 (or 230), 56 over her compliment aboard. These two ships embarked from Pisiguit, under the direction of Captain Alexander Murray. The livestock throughout the Minas, which were estimated at over 118,000, were left to roam aimlessly in the fields, but were later dispersed amongst the New England settlers, who had been referred to earlier as “proper British subjects”. Many other homes and structures were burned later, leaving no trace of the 75 years of Acadian occupation in the area. Saturday – December 13, 1755 – In Grand Pre, there were some Adacians deported on the scooner DOVE and about 200 on the Brigantine SWALLOW. Saturday December 20 – 120 Acadians were deported on the scooner RACEHORSE and 112 on the scooner Ranger, for a total of 732 that were embarked on the wintry nights of December, 1755 from Grand Pre. Thursday April 23, 1756 “An Act to impower the Justices of the several County Courts to make provisions for the late inhabitants of Nova Scotia, and for regulating their conduct”. The Acadians had regarded themselves as prisoners of war and were entitled to be supported as such, but the authorities would not accept this because it would be their responsibility to care for them. With this Act, except for those unable to because of infirmity, to be supported by themselves and labor for their own support, or be compelled to do so and, the children of those who were unable to support their children, were bonded out to those who could or would support them. Likewise the orphans were also bounded out. 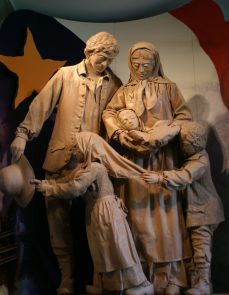 The Acadians were also ordered to render an exact list of their men, boys and girls and were not allowed to wander more than ten miles from their abode, or out of the county where they resided without a pass from the Priovincial or County Magistrate describing the person, residence and time and place of destination. Thursday May 14, 1756 – In Acadia, Lawrence set up a bounty of 30 pounds sterling for each male scalp over 16, and 25 for younger males or women and children. Although this was ostensibly limited to Indians, in practice, the English paid the bounties without inquiring into the race of the original owners of the scalps. Wednesday May 27, 1756 – The Acadians were quartered virtually as prisoners, not to leave town without a written permit of the selectmen under penalty of five days in prison or ten lashes. they depended on the cold hand of the public for food clothes and lodging and were given some provisions. (27 May 1756, Proceedings and Acts of the General Assembly of Maryland -[Baltimore, 1930] 24: 542 ff. – also Sollers “The Acadians (French Neutrals) Transported to Maryland” – Maryland Historical Magazine 3 (1907): 18. On July 28, 1755, Lawrence and the council decided to deport the Acadians. Since troops from New England were in the area (they had helped to capture Ft. Beausejour), he sent a note to Moncton letting him know that as soon as the transports (which had been ordered) arrived. Col. Winslow got orders to sail from Beausejour to Grand Pre with his 300 men. He arrived on August 15 and went to Fort Edward to talk to Murray. The Minas population in 1755 was about 4,500. Winslow’s list, made in September, had 2,743 people: males (>10) – 446, deputies (imprisoned at Halifax) – 37, married women – 337, sons – 527, daughters – 576, old and infirmed – 820. He clearly did not get a count of all of the people of Minas. The villages on the south side of Minas River (Cornwallis), sometimes called Minas or Grand Pre, were: Gotro, Pierre LeBlanc, Michel, Melanson, Grand LeBlanc, Gaspereau, Jean LeBlanc, Grand Pre. On the north side of the Minas River were the villages of the Canard section (around the Canard and Habitant Rivers): Claude Landry, Antoine, Hebert, Dupuis, Brun, Trahan, Saulnier, Poirier, Hebert. The other villages had <20 people. The most common names at Grand Pre and Gaspereau (in order of frequency) were: on the south side – LeBlanc, Melanson, Hebert, Richard; on the north side – Boudro, Comeau, Landry, Aucoine, Granger, Terriau, Dupuis. Ten of the vessels were sent to the Beaubassin area, but the 3 that weren’t needed (the Boscowan under Capt. James Newell, the Dove under Capt. Samuel Forbes, and the Ranger under Nathaniel Munroe) moved to the Minas area on Oct. 13. The Boscowan later ran aground at Pisiquid and wasn’t used in the deportation. The vessels were ready for use by October 11. Winslow arrived at Grand Pre on the 15th and camped on the plain where the priest’s house and church were located. The soldiers’ tents were placed around the churchyard. Winslow stayed in the priest’s house. He (Abbe Lemaire of Canard Church) had been taken in on Aug. 10. The officers were in a nearby house. The church valuables had been taken by the Acadians when told the church would become a storehouse for the soldiers. The camp was on high ground, NW of Grand Pre, with willows along the roads. There was a graveyard too. To the SE was the village with its scattered houses. Houses lay to the E and W. Winslow, age 54, had raised 2000 men to attack Beausejour. The camp was fortified. Lawrence thought this might make the Acadians nervous, but Winslow responed that they weren’t; they expected the soldiers to be with them through the winter. The Acadians had to supply the soldiers with food (for no money). It was harvest time, and they wanted the Acadians to harvest the grain before being deported. On Aug. 31 (Sunday), Winslow & 50 men toured Grand Pre. On Sept. 1, Capt. Adams & 70 men visited the villages of Canard and Habitant. On Sept. 2, Capt. Hobbs visited the village of Melanson, in the Gaspereau valley on the south side of the river. The commanders decided to have the Acadian men gather at the Grand Pre church to hear the king’s orders. The captains (Hobbs, Osgood, Adams) were sworn to secrecy. By Sept. 1, 3 transports had arrived. The Acadians wondered what they were for. Eleven more ships arrived over the next few days. On Sept. 2, Winslow took a whaleboat to Ft. Edward to meet with Murray to draft the “Proclamation to the Inhabitants” as follows. “To the inhabitants of the district of Grand Pre, Minas, River Canard and places adjacent, as well ancients as young men and lads.” “Whereas His Excellency the Governor has instructed us of his late resolution respecting the matter proposed to the inhabitants, and has ordered us to communicate the same in person, His Excellency being desirous that each of them should be satisfied of His Majesty’s intentions, which he has also ordered us to communicate to you, as they have been given to him: We, therefore, order and strictly, by these presents, all of the inhabitants as well of the above-named district as of all the other districts, both old and young men, as well as the lads of ten years of age, to attend at the church at Grand Pre, on Friday, the 5th instant, at three in the afternoon, that we may impart to them what we are ordered to communicate to them, declaring that no excuse will be admitted on any pretense whatsoever, on pain of forfeiting goods and chattels, in default of real estate. Winslow wrote on Sept. 4 in his journal that in the morning he sent for Dr. Rodion (Dr. Whitworth) to have him deliver the Citation to the people, who were busy harvesting.The next day, 418 men entered the church. He basically said your are prisoners and your belongings are forfeited. He retired to the priest’s house, where some of the older Acadians went and begged him to consider their families, who didn’t know what had happened. Winslow allowed 20 men (10 on each side of the Cornwallis) to go back and tell the women and children that they wouldn’t be harmed. They were also to bring back any who hadn’t shown up, with the men still in captivity held responsible. The family & friends of those imprisoned had to provide them with food. Though they could move about the enclosure, they couldn’t go east of the officers’ quarters. By the 7th, only 5 transports had shown up. There were now 424 prisoners. The prisoners had been allowed (20 a day) to return and spend a night with their families. On the 10th, the people sent a request to Winslow that they be allowed to go to French soil and be given time to get ready. They even offered to pay their way. Winslow noted that there was more commotion among the Acadians that morning. So he planned to put 50 young men on each of the 5 ships to lessen the danger of rebellion. Pierre Landry (who spoke English) was summoned and told to prepare the 250 men. The men, in columns 6 deep, were on the left of the whole group, with 80 armed soldiers around them. The order was given to march, but none moved. You can imagine the scene, crying, pleading, calling out to each other. Boys said they wouldn’t leave without their fathers, but Winslow couldn’t understand them. The soldiers brandished their bayonets and the men were forced to start moving. People from the villages lined the road down to the landing place at Gasperau, 1.5 miles away. They were put aboard smaller vessels and shuttled out to the ships. Boats carried as many wives & mothers as they could carry each day to the ships to bring provisions. There were 363 soldiers at Grand Pre. It seems that they hated the French, since Winslow had to make an order to protect them. By mid September, Winslow had finished a list of people and livestock. The harvest had not been completed. An Acadian woman who was there told her story of the deportation of what had happened. It was recorded by Thomas Miller for the Historical and Genealogical Record of the first settlers of Colchester County. Finally on the 27th, the fleet of 14 vessels (2 connvoyed by frigates) set sail. There were 2898 people on board. Dudley LeBlanc made up a list of the men deported from Grand Pre. The vessels went to Philadelphia (3), Maryland (4), Boston (1), and Virginia (5). Note: In Naomi E.S. Griffiths’ – “The Acadian Deportation: Deliberate Perfidy or Cruel Necessity”, p. 9, she says that they sailed on the 29th. The first wave of deportations included about 24 vessels. They were escorted by 3 ships: the Nightingale (under Capt. Diggs), the snow Halifax (under Capt. Taggart), and the armed schooner Warren (under Capt. Adams). Though we don’t have a complete listing, here are some of the ships. The deportation at Beaubassin was not less severe. Though it was easier for them to escape, some were treated worse than in Grand Pre. According to Al Lafreniere, “those who were exiled from Chignecto (Fort Beausejour) were seperated from their families purposely. This was to punish the Acadians for participating in the battle with the English at Fort Beausejour.” One common idea in many Acadian writings is that the British intentionally separated families. Generally, this was not the case. Beaubassin was the major source for this idea. About 100 wives chose to try to avoid exportation rather than join their husbands. So some of them ended up in different locations. Things didn’t go so smoothly for Major Handfield at Annapolis Royal. He wasn’t able to gather the local Acadians till December. So he sent the transports in the bay to Minas. Three of those vessels went to Pisiquid. Those that weren’t used at Minas were sent back to Annapolis Royal. Finally, at 5 a.m. on December 8, 1755, those ships set sail from Goat Island with the Port Royal area Acadians. Some Acadians (about 1000) tried to hide out in the woods. About half the Port Royal inhabitants headed for Cap Sable. Many of these were captured or migrated elsewhere. Thousands more headed for French territory. The entire community of Cobequid left as a group, so that when the British soldiers arrived to round them up they found the area deserted. Many went to the New Brunswick area, and many of these on to Quebec. It is estimated that 2000 migrated to Isle St. Jean, and some to Isle Royale. The Acadians on Isle St. Jean found that their escape was only temporary. When Louisbourg fell in 1758, so did Isle Royale and Isle St. Jean. Even though Isle St. Jean hadn’t really participated in the conflict, the English goverment ordered their removal. The events of the 1758 exile are covered at that webpage. In 1758, some citizens of Halifax wrote a letter to someone in England and mentioned how Lawrence had displaced people “who have behaved with integrity and honesty.” Lawrence had called the council a pack of scoundrels, and merchants a parcel of villains. It told how the cattle, etc. of the Acadians had been converted to private use (ie. 3500 hogs and about 1000 cattle were killed at Pisiquid and sent to other places). Perhaps 14,000 of 18,000 Acadians were deported between 1755 and 1763. Perhaps 8,000 of them died. [Herbin, 125-128]. have been true, but the claims of supplying livestock to Quebec was all wrong. The Acadian Gautier (Nicolas’ son) was the only one who went with Indians on scalping raids. [Harvey, p. 195]. The deportation of Ile St. Jean went slowly. Some were escaping (with French help) from the north shore, but Capt. Hay in charge of the transports wouldn’t allow any of them to go there. On Oct. 29, Lord Rollo reported 1500 embarked. On Nov. 5, Admiral Durell reported 2000 embarked on 16 transports and sent as cartel ships to France. On Nov. 6, Whitmore reported to Pitt that 2200 were embarked but Rollo had to leave a whole parish (of a far part of the island) behind. Rollo returned to Louisbourg on Nov. 14. Over 700 people were on the 2 largest ships … the Duke William and the Violet. With the 5 smaller ones holding 600, there would be a total of 3500 deported in 1758. Of these, 700 were drowned. But, were these 7 ships part of the 16 mentioned by Durrell? Meanwhile, the Acadian exiles in the American colonies weren’t doing very well. Only Connecticut had made any arrangements (in Oct. 1755) to accept the refugees. A petition was filed there in 1766 for payment of coffins for the Acadians (called French Neutrals). From 450, many had died … leaving 217. SC gave the Acadians vessels and they (1/2 made it) sailed up to the St. John River. Those in GA were allowed to make boats and headed north. They got as far as MA when Lawrence had their boats seized and imprisoned them. Things were also hard in MD; many left for Canada when they could. Those sent to VA were refused landing, and were taken to England. Four of the 20 ships never made it. One was lost. Storms blew two to Santo Domingo. Another was taken by the Acadians back to Acadia. It only applied to those who were useful/employed. Their service was to be contracted, with a time limit and amount to be paid. Under this act, 110 Acadians (58 girls, 52 boys … almost all <21) who came from Georgia in August 1756 were bound out. For a while, some of them were kept on Governor’s Island, N.Y. Bay, until distribution to Winchester and Orange counties by Aug. 26, 1756. A list of family head and number of children is given in the book. In the N.Y. colony, 332 Acadians arrived in May and August 1756. The counties received: Kings (9), Orange (81), Queens (44), Richmond (13), Suffolk (44), and Westchester (141). The county had 55 minors bound out. Every now and then, Acadians arrived in NY from GA. On Aug. 29, 1756, the sheriff (Willet) informed the govt. of 44 Acadians that needed care. There were sent to various places (Bedford, New Castle, etc.). Nine were distributed on Oct. 16, 1756. In July 1757, a group of Acadians from Westchester escaped and were captured near Ft. Edward, on their way to Crown Point. In Aug. 1757, the N.Y. council ordered that Acadians in their counties be put into the jails. This was done to the male Acadians by Aug. 13. A N.Y. merchant (Daniel Jauncey) offered the council to pay to ship the Acadians away (on behalf of the Acadians), but it didn’t work out. In 1765, the Marquis de Fenelon said he’d accept 150 of them in the West Indies, but the offer was ignored. On June 4, 1760, 22 vessels, led by a brig of war, arrived. They found 60 ox-carts and yokes … left by the Acadians. They found bones of starved animals and ruins of homes. The dykes had broken in a 1759 storm (and Acadians helped repair them). The Grand Pre and Gaspereau area was now called Horton. [Herbin, 128-148]. From “The Acadian Miracle” by Dudley J. LeBlanc. Spellings are as recorded by Winslow. NOTE: Leblanc sometimes made errors in his transcriptions. When the war was over in 1763, a few thousand Acadians headed for Canada. In 1766, about 800 of them gathered in Boston and left by land, headed for Acadia. Four months later, they had gotten to the isthmus of Shediac and heard that Grand Pre was settled by others. So many of them stayed right there. About 50-60 continued on to see their former settlements in Acadia. The men and women there were threatened and angry at the pitiful travelers. They eventually reached the deserted shore of St. Mary’s Bay and settled down. They built log homes and started fishing, hunting, and clearing the land. Remember, Lawrence had 70 deputies imprisoned in Halifax. Of those, 50 were deported separate from their families. The rest were put in a ship that went to Port Royal to pick up more Acadians. Acadians who made their way back to their homeland found they could not settle together in large groups and their land was now occupied by people brought over by the English. 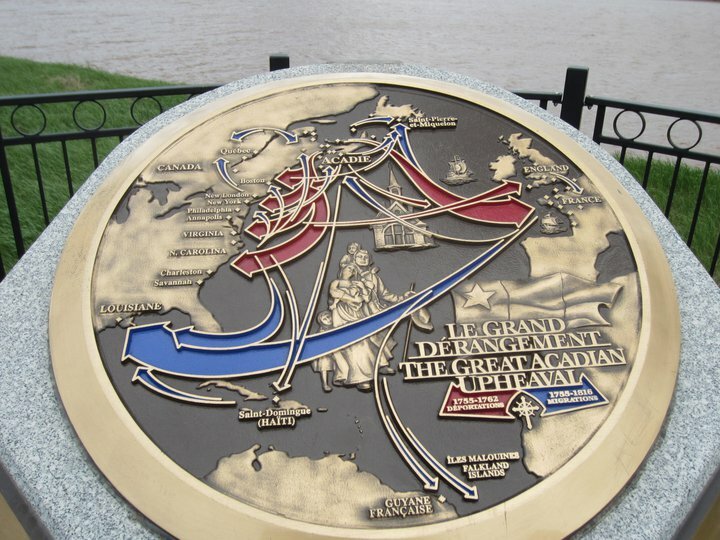 As a result of the Grande Derangement, two “New Acadias” were formed … one in Louisiana and one in New Brunswick. Only in these places (and small settlements nearby) did the Acadians manage to maintain their identity into the 20th century.